Philippine Airlines Promo 2015: Enjoy free baggage allowance, on board meals, and warm caring service that is distinctly Filipino. 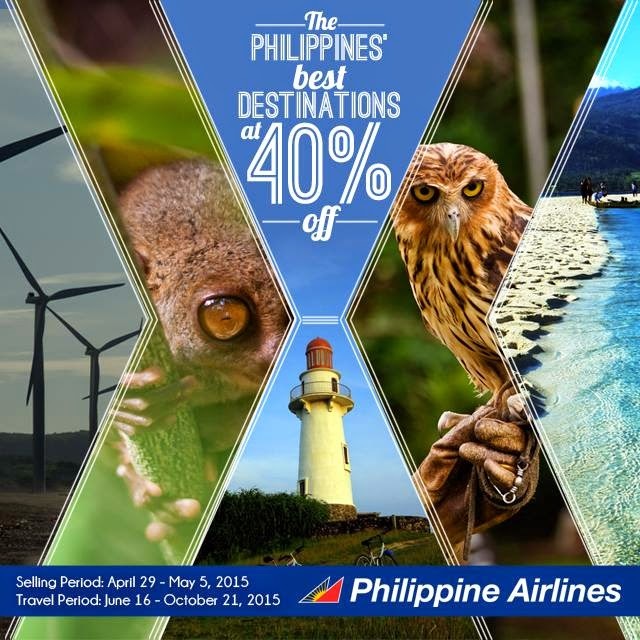 Simply avail this 40% Off promo! It's time to explore the Philippines and experience the many wonder beauty of it's nature! You can only have it through Philippine Airlines (PAL). What are you waiting for? and warm caring service that is distinctly Filipino. FARE CONDITIONS: Fare is equal to base fare + government taxes & fees + ticketing service fee. For Domestic Budget Economy, fares are valid for one way and combinable either for roundtrip travel or with any other booking class subject to conditions of each fare class. Ticket is refundable with a refund fee of Php 1,500 per sector inclusive of 12% VAT, Change fee of Php 1,500 per sector inclusive of 12% VAT and fare difference if applicable. Ticket is considered No Show if ticket is not reissued /refunded at least 4 hours prior to flight departure or if passenger fails to check-in on time. No Show/Non Users fee of Php 1,000 per sector inclusive of 12%VAT. For tickets that will be reissued at least 4 hours prior to flight departure upgrading to higher fare permitted; reissuance should be equal or higher fare amount. Infant fare is 90% of adult fare. Downgrading to lower fare amount not permitted. With mileage Accrual of 50%. Book and Buy, seats are subject to availability, other travel conditions apply. BAGGAGE ALLOWANCE: Fare is inclusive of 7-kg handcarried baggage and 10-kg free baggage allowance. 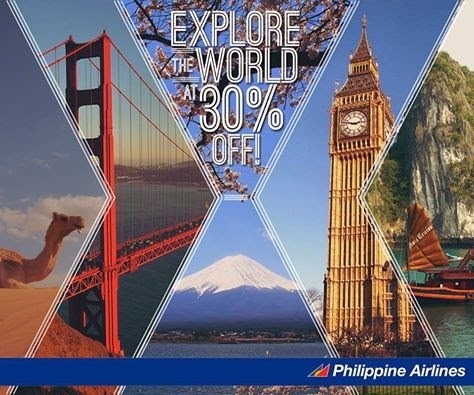 Philippine Airlines Promo 2015-Exploring the world is much better with someone. Get as much as 30% slash off your fare when you book your flights now at http://www.philippineairlines.com/ to our international destinations! Enjoy free baggage allowance, on board meals, and warm caring service that is distinctly Filipino. FARE CONDITIONS: Fare is equal to base fare + government taxes & fees + terminal fee + ticketing service fee. Fares are subject to change due to currency conversion rate. Fare is non-refundable for totally unused and partially used tickets. Fare is non-reroutable, non-endorsable, non upgradable. Philippine Travel Tax is applicable to Philippine passport holders, foreigners holding a Philippine resident visa, and foreign tourists or expatriates who have stayed in the Philippines for more than one (1) year. Ticket is non-transferable. Ticketing Service Fee is not applicable for web purchase. Fare is refundable when application for visa is denied. Passenger must show proof of application and denial at any PAL ticket office. Flight reservation must be cancelled upon passenger’s receipt of visa denial or 7 days prior to departure, whichever is earlier. For visa denial within 7 days prior to departure date, PAL will collect No-Show fee unless booking is cancelled 24 hours before departure date. Infant is not qualified for this promo fare. Child fare is 100% of adult fare. Quoted fares are rounded off to the nearest whole number. Other conditions apply based on existing fare basis of the ticket. Minimum of 2 passengers; must travel together both ways. Travel must be booked in one transaction. BAGGAGE ALLOWANCE: Fare is inclusive of 7-kg handcarried baggage. Free check-in baggage allowance is 20kgs for Hong Kong, Macau, Jakarta, Bali, Shanghai, Beijing, Xiamen, Guangzhou and Jinjiang; 30kgs for Singapore, Bangkok, Australia and London; 2 pieces a 23kgs each for Fukuoka, Osaka, Riyadh and Dammam; 1 piece at 23 kgs for Nagoya, Tokyo, Guam, Honolulu, Los Angeles, San Francisco, New York and Canada There may be additional fees for your checked baggage in excess of your free baggage allowance. SALES CHANNEL: Promo is for all Philippine Airlines Ticket offices and Philippine Airlines Web and Mobile site only (philippineairlines.com). If customer is using a mobile device, only MasterCard card is accepted as form of payment. No Promo Code needed.